Max order quantity of 2. Huge end of season sale! Buy now and save big. 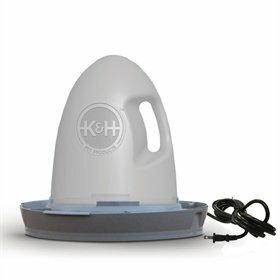 This 2.5 gallon capacity heated waterer can be used year-round for your poultry. Only plug it in when you need to. The easy-to-remove filter tray allows you to clean the water tray in seconds. No draining needed--just remove the filter tray and tap lightly or spray with water to remove debris. It really doesn't get any easier than that, does it! The spill-proof cap guarantees no spilling. No more spilling out half the tank trying to assemble it into the base. The water tank is fully contained with this nifty little cap until assembled on the base. Carrying a poultry waterer tank can be a challenge, but we've got that "handled!" Just pick it up and go. Plus, the no-rust materials ensure many years of rust-free use. The design keeps your chickens from roosting on the top, eliminating droppings in the water and over the tank. The manufacturer warrants that this product will be free of defects and workmanship for two years from date of purchase. See warranty image, above, for more details. Fill water reservoir with water. Seat the plastic plug into the hole in cap. Screw cap snugly onto filled water tank. Be careful not to cross thread. Place base on a dry, flat surface, then set water tank onto base. 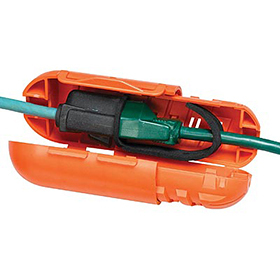 The spike in the center of the base will dislodge the plug in the cap of the tank and automatically fill the water base.